Private Capital Markets Awards – are the only national industry awards for private capital markets professionals, which recognize business leaders who help build a vibrant and successful private capital markets in Canada. 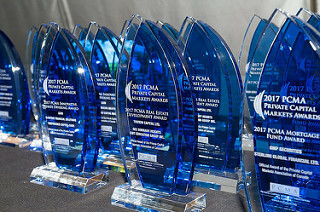 In 2012, the PCMA launched these national awards as the first and only national industry awards for exempt market issuers, dealers and professionals that promote best practices and high standards of conduct in the private capital markets. Nominees are evaluated based on their leadership in the industry, their contribution to the deal, innovative market, product or investment opportunities created, the benefits of the deal for the issuer and for investors, and the overall impact of the deal on the quality and integrity of the private capital markets. The award selection committee is comprised of independent members of the PCMA and its national Board of Directors. Capital raised in the private capital/exempt market helps finance economic activity across Canada and is an important contributor to supporting entrepreneurial business, and creating wealth for Canadian investors. The PCMA believes in celebrating and promoting the success stories of the private capital markets. We recognize the professionals behind those successful capital raising transactions and the successful outcomes they generate for issuers, dealers and investors. You can review pictures from the previous awards ceremonies HERE. Michael White, President and Chief Executive Officer, IBK Capital Corp.
“I am very grateful for the recognition by my peers through this award. Private mortgage lending in this country has had a long history of providing essential services to Canadians. Through our services and products, we assist homeowners through economic hardship to financial success and prosperity. We keep Canadians in their homes, business growing and finance new communities for us all to live. In my 20 years in the business, I have had great mentors, teachers, industry partners and members who worked tirelessly to help others and build an industry they could be proud of. As I look to the next 20 years, I see an industry that will continue to grow, support the economy, strengthen our professionalism, and be good financial stewards of our resources. I would like to also thank my father and business partner, Everett Koeller for his unwavering support." David M. Gilkes, President, North Star Compliance & Regulatory Solutions Inc.
Nadine Milne, CPA, CMA, Chief Compliance Officer, Portland Investment Counsel Inc.
CLICK HERE TO CREATE YOUR ACCOUNT AND NOMINATE YOUR DEAL TODAY! Interested in Sponsoring the PCM Awards? For more information on how to become a sponsor of the PCM Awards, please contact us.